Genius Box is the PUP that uses misleading techniques to prevent removal. Use Reimage to locate malicious components and get rid of them faster than with uninstall instructions. A full system scan blocks virus reappearance and prevents traffic to malicious domains. 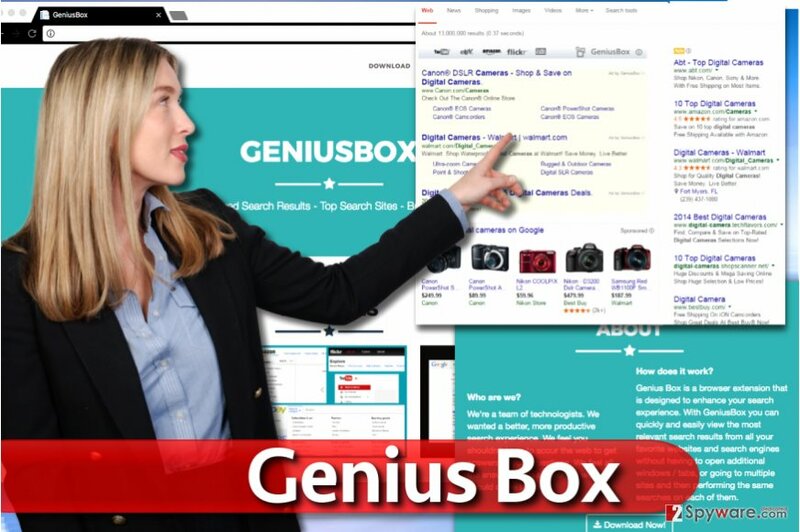 Genius Box is a suspicious free program that aims to inject sponsored content above regular search results. It was developed by TGF Interactive, LLC. This spyware variant is set to modify search results delivered by regular search engines and integrate sponsored content into them. 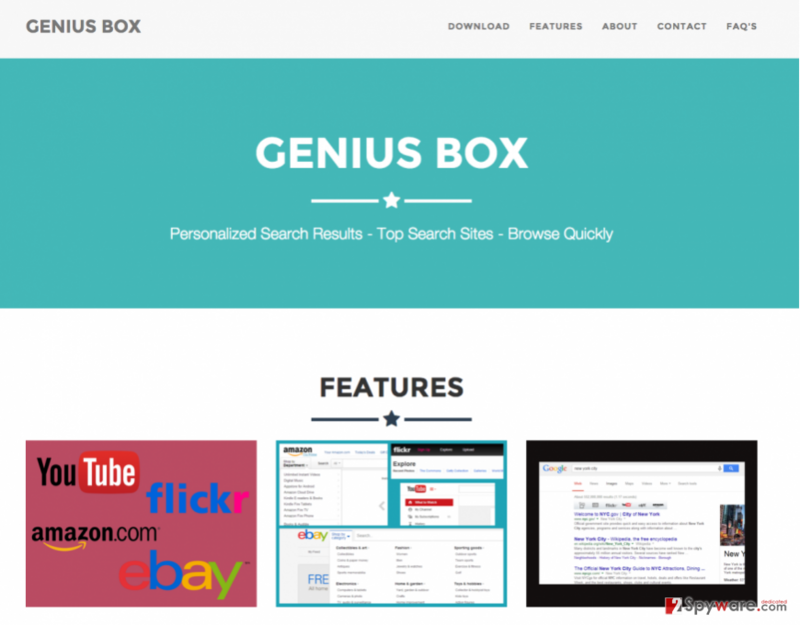 Ads by GeniusBox are going to appear above all search results. It is recommended that you stay away from these results because clicking them can trigger redirects to highly untrustworthy or even malicious websites. Adware drops its own extension on all web browsers, including Internet Explorer, Mozilla Firefox, and Google Chrome to settle the changes and prevent the user from modifying them. Despite promises to enhance user's search experience, this ad-supported program can only pose a threat to the system and user's privacy. Due to these issues, we suggest you remove Genius Box for good. Reimage software can complete this task safely. You should be aware that the only goal of this obscure search tool is to serve promotional content, make users click on it, cause URL redirections to predetermined sites and increase their popularity. Each of the redirects generates pay-per-click revenue for the suspicious developer of this junkware but poses a threat to the user at the same time. External websites that can be accessed via this search engine are likely to be dangerous or simply untrustworthy, so our team recommends performing a complete Genius Box removal ASAP. Collected data is shared with third-party advertising networks that use it to select and deliver targeted ads to the user. On top of that, these ad networks are allowed to use tracking cookies as well. We highly suggest you reconsider if it is worth using this ad-supported program because you can never know if it stores your information securely and how it is being manipulated. If you want to prevent it from collecting and storing such data, remove Genius Box immediately. Genius Box virus injects sponsored entries above regular search results no matter what search engine the victim uses. In addition, this browser add-on may start acting like a traditional adware that serves ads in a form of pop-ups or banners. Soon enough you may start noticing annoying ads that may link you to unknown websites. You won't miss its continuous pop-up ads that are labeled “About this Genius Box ad”, “GeniusBox ads” and “brought to you by TGF Interactive.” These are the ones that pay for promoting them because they want to increase their page rank or sales. Beware that you can't be sure that such ads won't redirect you to an infected website that promotes malware. If you haven't installed this program consciously and now you see continuous pop-up ads, please check your computer with the reputable anti-spyware. This potentially unwanted application has been promoted via its official website as a useful tool for personalized search sessions. However, it has been distributed even more actively as an optional component of the freeware and shareware. Despite that, you should understand that adware is not a critical virus and therefore it can't be installed on your computer without user's interaction. What programs could lead you to the installation of this browser extension? Beware that you can easily install it in a bundle with some converter, download manager, video player and similar freeware. If you still want to install a free program on your computer, you have to monitor each of its installation steps because it may be filled with optional components. We highly recommend you to select Custom or Advanced installation of the freeware and then uncheck pre-checked check boxes that report about this or other browser add-ons, extensions and plugins. This is supposed to help you to avoid continuous pop-up ads that are labeled as “About this Genius Box ad” and “TGF Interactive”, and similar issues that are typically caused by potentially unwanted programs. It is not hard to remove Genius Box virus from the system. 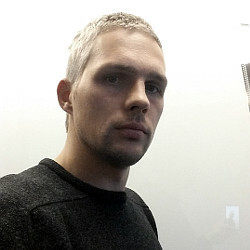 If this browser parasite showed up on your computer right after installing other application, 2spyware security experts recommend removing it from the system along with the software that brought this spyware variant into the system. For that, you can either scan your computer with the reputable anti-spyware (all tools that were used for testing this app are given below) or follow Genius Box removal instructions given below. Open Control Panel using instructions given below and uninstall whatever version of GeniusBox is installed on your system. It might be 2.0, 3.0 or further version of the adware. Here, look for Genius Box or any other recently installed suspicious programs. Wait until you see Applications folder and look for Genius Box or any other suspicious programs on it. Now right click on every of such entries and select Move to Trash. When in the new window, check Delete personal settings and select Reset again to complete Genius Box removal. Once these steps are finished, Genius Box should be removed from your Microsoft Edge browser. Firefox can be cleaned manually. All that you need to do its to get rid of Firefox add-ons related to it. Here, select Genius Box and other questionable plugins. Click Remove to delete these entries. Now you will see Reset Firefox to its default state message with Reset Firefox button. Click this button for several times and complete Genius Box removal. Check Chrome and delete extension associated with the described adware. Here, select Genius Box and other malicious plugins and select trash icon to delete these entries. Click Reset to confirm this action and complete Genius Box removal. Here, select Extensions and look for Genius Box or other suspicious entries. Click on the Uninstall button to get rid each of them. Now you will see a detailed dialog window filled with reset options. All of those options are usually checked, but you can specify which of them you want to reset. Click the Reset button to complete Genius Box removal process. ^ What Are Malicious Websites and Drive by Downloads?. Norton Internet Security Center. Tips, Education & Answers. ^ Tracking cookie. Symantec - Security Response. Unparalleled Analysis of and Protection from IT Security Threats. ^ Liam Tung. Google: Unwanted bundled software is way more aggressive than malware. ZDNet. Technology News, Analysis, Comments and Product Reviews. This entry was posted on 2017-06-14 at 05:23 and is filed under Adware, Viruses. You can quickly scan the QR code with your mobile device and have Genius Box manual removal instructions right in your pocket. How did you remove Genius Box?